Poet’s Notes: In Nietzschean philosophy, the concept of the eternal recurrence is postulated as the ultimate test for the ubermensch: can he affirm life so much that he would will that, in all its sorrows, that it recur exactly as it has not once, but over and over ad eterniam? If so, he has embraced the amor fati – the love of fate. To achieve this degree of acceptance requires such enormous strength that it feels rather like stepping near the edge of a cliff. To live with the refusal of regret, the embracing of all error? My tailbone shivers at the thought. Aesthetically, this poem came to me swiftly. 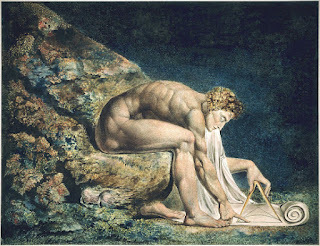 One source of inspiration was two of William Blake's paintings: Newton (pictured) and the Ancient of Days. Both see the central figure—Sir Isaac Newton and the pseudo-mythological Urizen, respectively—employing a geometer's compass to reckon unknown angles. This imagery seemed fitting for the fearful task of measuring the harrowing depths of suffering repeated forever in an eternal cycle. The rest was simply a natural outgrowth of the theme.